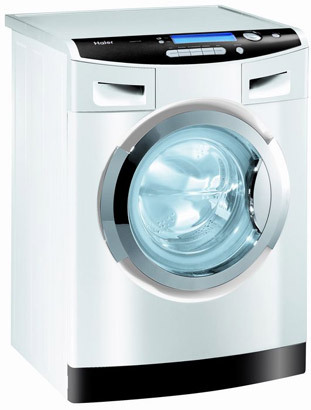 Haier WasH2O Cleans Clothes Without Detergent | OhGizmo! I’m not really sure what detergent is, but I guess it’s a big deal that the new WasH2O washing machine from Haier doesn’t use any of it. Instead, it uses dihydrogen monoxide, a dangerous chemical that corrodes metal and can be deadly if inhaled. The dihydrogen monoxide is separated into two ions (OH- and H+) which can apparently remove stains and sterilize fabrics. Whether or not you decide to call that “clean” is up to you, since there are lots of totally gross things that are technically sterile. Ew. The WasH2O can handle a soiled 6kg of unmentionables in about 29 minutes and comes in 6 different stains for a smudge under a grand; currently available in France. If you’re concerned about the potential dangers of dihydrogen monoxide, you can learn more about it here. Dihydrogen monoxide, the dangerous chemical that corrodes metal and can be deadly if inhaled, is nothing more than common H2O…. quite so, quite so…. Yeah, this washer works so well that it has TWO detergent drawers! Dihydrogen monoxide…LOL! Well, water CAN be deadly if inhaled! ROFL!